Welcome to Lizzie's Hats. I have a stunning collection of high-end designer hats and headpieces available to hire and purchase. My collection can be viewed at our studio near Hungerford and please contact me to arrange an appointment. Please enjoy my world of hats! Please look in both collections (Autumn/Winter and Spring/Summer), as some hats/headpieces are suitable for all seasons. We have over 400 hats and headpieces for all seasons, we hope you enjoy browsing our collection. Royal Ascot is the high­light of the British Rac­ing cal­en­dar and is an age old tra­di­tion that dates back to 1711 when it was founded by Queen Anne. It rep­re­sents Our coun­try to the full with its ele­gance and sophis­ti­ca­tion. How to choose the right hat for your face shape. "I'm wearing Lizzie's hats to Royal Ascot every year and I'm always asked for photos as they are so beautiful. Lizzie has really exclusive hats which cost a fortune to buy, its amazing value!" "I always look forward to needing a Lizzie hat. She has a fantastic range of styles and colours and makes the whole choosing experience enjoyable and fun!" "Beautiful hats, beautiful service! Lizzie has a fantastic eye for her hats and the individuals wearing them, offering a vast selection of millinery magic from the traditionally beautiful to the crowd-pleasing show stoppers"
"A fantastic selection of hats at great value - I'll never bother going anywhere else!" "Lizzie offers great honest advice, and makes hat hire so easy. Picking up and dropping off at the races eases so much pressure on what can often be busy day!" "Lizzie never fails to have the perfect hat for every occasion with lots of variety and its always a fun experience paying her a visit"
"I cannot speak more highly of Lizzie's hats. 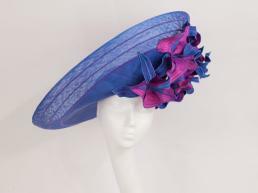 Fabulous advice and reasonably priced, not to mention the stunning hats available. Will be coming back next year without a doubt!"